Freda in window, update number three. 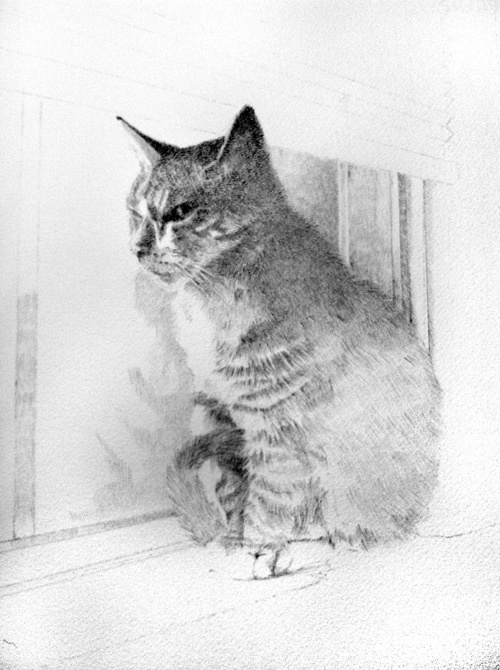 Still using the 2H woodless pencil, followed by a light covering of a HB pencil, I defined Freda’s chest and darkened the window sill. Freda in window, update number three. I defined the chest area by lightly shading the sunbeam area on the window. Part of the window sill can be recognized now, and I have also deepened the body, and darkened parts of Freda’s head and side. Again, at this point, I am using a 2H woodless pencil and an HB pencil.